I have always wanted to bowhunt the South Texas brush country. Everything is different down here. The deer are much smaller in body size (compared with Kansas and Northeast Deer) but they are known to wear some impressive headgear. The temperatures in mid-December are warm and comfortable, compared with the frigid winter back home. And the terrain reminded me more of Africa than anywhere I've ever hunted in North America. After a very disappointing rut back home, I made a last-minute decision to hunt at Drew Butterwick's operation in Dilley Texas. Gotta love those Texas Supermarkets - Feed inside, Feeders outside. Some things you need to know. 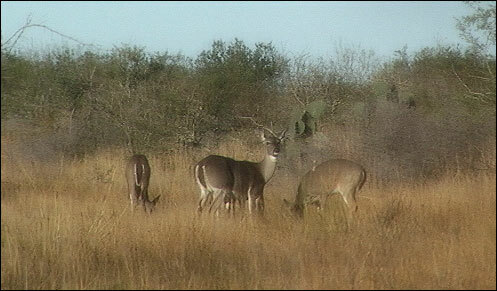 Nearly all bowhunting in South Texas is done over bait, either feeders or hand-corned roads and pastures. While many bowhunters will likely frown on the use of bait for whitetails, it is almost impossible to hunt them any other way. I chose not to hunt over spin feeders but I did hunt hand-corned roads and pastures. I would also spend a considerable amount of time rattling - a technique the brush county bucks are famous for. My guide for this trip would be John Mathews. John is a super nice guy who grew up in Texas. He was not your typical Texan, did not wear a Ten Gallon hat, and no belt buckle (a common joke among us). Along with John was Drew's lovely wife Teri - who would be our cook for the next few days. This would be a short trip - only 3 days and a morning. My tight schedule prevented me from enjoying a full bowhunt. My first morning found me in a makeshift blind, heavily brushed over and next to a baited dirt road. The morning was slow and a small group of does appeared shortly before 9:00 AM. A slow start, but I was optimistic nonetheless. 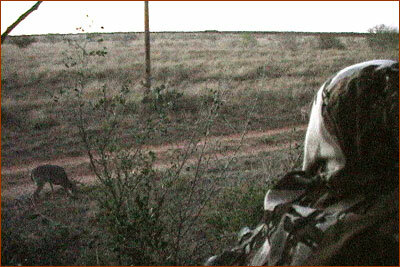 For the afternoon hunt, John suggested a tripod stand which was effectively buried in a Mesquite tree. The stand was great, well concealed yet with no obstruction for a shot. Video was going to be extremely difficult from this stand, as can be seen with the "lack" of pictures and videos from this stand. The afternoon was quite warm, in the '80's. At 5:00 PM a small group of does walked in and began feeding on corn. The rut was in full steam right now and while the does fed, I could hear a buck raking a tree behind me. I couldn't see him through the thick brush but I could see a tine here and there. He looked good, but I needed a better look. As the does fed, the buck grunted and they moved off - they were not ready for the buck. He moved closer and into view. He was a symmetrical 8 with decent tine length. But he was 'spindly' and lacked mass and age. He appeared to be 2.5 years old and would be a super trophy in 2-3 years. I had no intention of shooting such a young buck. My guess is he'd score 120 gross. Before I could get him on video, he chased a doe behind him and disappeared. Forty minutes later, as it was getting dark, another buck fed in alongside some does which appeared on the seen fifteen minutes earlier. He had decent mass, but he had no spread and his tine length was short. Not a shooter. The deer fed at that road until John showed up in his truck and pushed them back into the brush. A good night for sure! 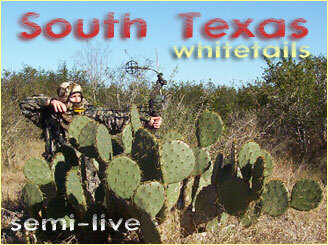 Our Texas bowhunt takes place in Southwest Texas Brush Country with White Antler Ranch - Dilley Texas.